Purple Leaf Farms: Come Meet Us at the Good Food Festival March 15!!! 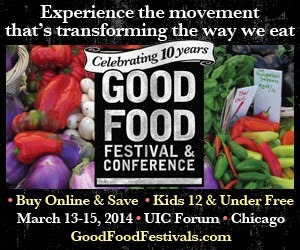 Come Meet Us at the Good Food Festival March 15!!! How: Go to the Rafflecopter link and claim your raffle tickets. Raffle will be going on throughout the chat! We are so excited to be part of the Good Food Festival this year! We'll be hanging out at the CSA Pavilion where you can come meet us, see examples of what our CSAs will look like, and chit chat about the farm. Also, later that evening you should definitely join us for the Band of Farmers Talent Show taking place that the Hideout in Chicago. A dozen local farmers will get up on stage and entertain you with music, poetry, and whatever we can come up with. You can see me, Farmer Jessica, play a couple farming-related tunes on my big ole red guitar. Tickets for the Band of Farmers show are on sale now! In addition to the CSA Pavilion, the Good Food Fest will have TONS of local / sustainable food organizations and vendors, presentations, and round table discussions. It is such a great event if you are at all interested in local food! Look for us at the CSA Farmer Pavillion. Afterwards, join us at The Hideout 7-10PM for a beer and our 2nd Annual Band of Farmers Talent Show. ion, the talent show, and giving small farmers like us the opportunity to participate!